[S628] land Registry Documents, Land Registry Office, Pembroke, Ontario. 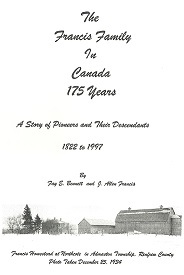 [S847] The Admaston Heritage Book, Carol Bennett and The Balsam Hill Women's Institute, (Name: Juniper Books;). [S3] "Ontario Death Registrations Online at Ancestry.ca", FamilyTree.Com, (Name: Subscription www.ancestry.ca;), # 024729 Admaston Twp., Renfrew Co., Ontario (Reliability: 3). [S504] Gravestone of William Francis.